Part of the point of argument is to build shared reasoning. A dangerous feature of modern life that infects the 'liturgy wars' is the temptation of thinking that if you just find the Magical Method, all things will automatically fall into place; for all sides in the 'liturgy wars' tend often to treat liturgy as method. The Church is as it already was, and it is what it already was. It is its past, not only in that its past pushes along behind it, and that the Church possesses what is past as something present-at-hand and effective, but also that hte Church has grown up in a traditional way of interpreting and understanding itself, and by this understanding its possibilities are disclosed and regulated. It is an error to treat tradition and its primordial sources as opposed. Vestments are both signs and gear, but they involve the notion of carrying so as to express a being-related to the world. As role-gear, clothing differs from characteristic tools by being not merely carried (like a hammer in the hand) but in some sense carrying itself in being carried. We carry our clothes in wearing them by arranging them so that they do the carrying (hanging, buttoning and fastening, tying, conforming). The being of the Church Militant is the Passion of Christ; its traditionary sojourn through the world is its fulfillment by the Passion. Sacramental vocation is the vocation of Christ's Passion. The fortitude of the Church: its founded-on-the-Rock-ness; the prudence: its helped-by-the-Spirit-of-Truth-ness; the justice: its many-members-in-one-Body-ness; the temperance: its chasteness-as-the-Bride-of-the-Lamb-ness. The cultural goods of the Church as material for the disclosure of the Church as it has been. The Church is based on Tradition, and its calendarizing of its worship is a way of making accessible the Tradition within which it works. but the Church works with many calendars, as it were spreading out and shifting around within this Tradition. Even a stupid man's traditions have a sort of dignity. methods of seeking the right vantage for problem-solving. Our world is such that it works in several ways as if it were a world in which a detective named Sherlock Holmes lived on Baker Street and vanquished Moriarty at Reichenbach Falls. (Our world is such that it also works in several ways as if it were a world in which a general named Julius Caesar crossed the Rubicon, and was slain by Brutus and others.) It isalso such that it works in several ways as if there were no such detective at all. This has to be stronger than mere consistency, but of course much weaker than requirement, or even apparent requirement. Our capacity to invent fictions arises naturally from our ability to inquire into things. The orthopraxy relevant to the liturgy consists of acts of faith, hope, and love. "For it is in him that our human nature becomes a redemptive offering." From the craving of the world springs impatience and cruelty, jealousy and conceit and self-exaltation, boorishness and selfishness and irritability, retaliation and self-indulgence and lie, despair, and, in the end, death. Patience is required for the full fructification of love. The body of the Church is a picture of the Spirit. Straw man and idealization are both based on one argument/position representing or modeling another. the heart is not so firm and sure. too often love does not endure. thus all the laws of time to flount. and weather even raging storm. no human word is guarantee. too often lovers' hopes will flee. for it is real and ages long. It quickly becomes clear that what the authors call 'invented traditions' are in fact one way in which traditio, handing down, is standardly done. The forest of old ways tends to dry up and burn out as people lose a sense of their purposes and meanings, or as invasive species take root and steal away their original nutrition; something must fill the void left. Either those old ways will be entirely replaced, or there will be some revitalization. If they are replaced, the new ways become the new forest, and undergo the same cycle. Residues and remnants of old ways, sometimes scholarly, sometimes distorted, sometimes only speculated, sometimes entirely imaginary, often become the seeds for either a return of something approximately like the old forest, or, more often, a compromise forest between the old and the new. The return of the old ways is often merely approximate, or by analogy, or sometimes more as a symbolic aspiration than an actual return. And the cycle begins again. 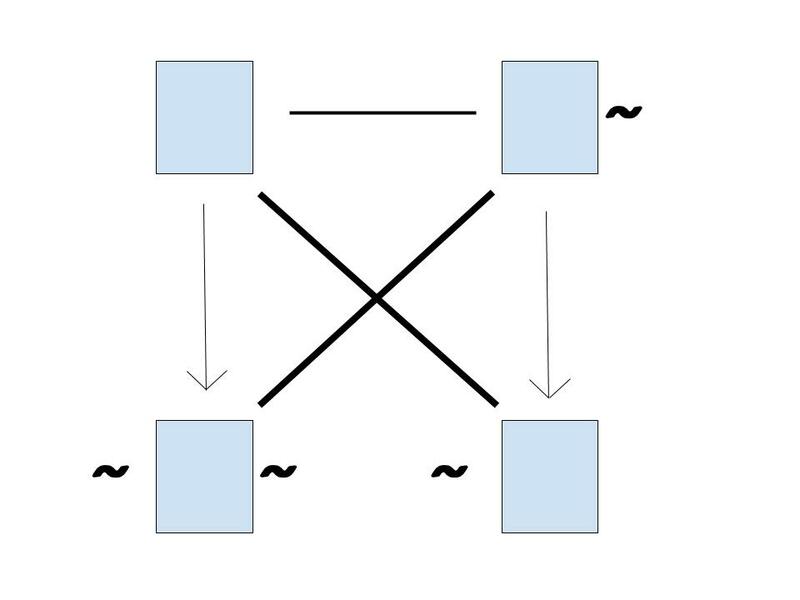 The actual processes involved are, of course, various, and, despite the name 'invented traditions' are not necessarily invented in the ordinary sense of the term -- they may just be a shift from a literal understanding to a symbolic one, or they may just be natural responses, consistent with prior traditions, to new situations that become stable precedents. They may -- indeed, in the Romantic period often were -- scholarly reconstructions, or, even more commonly, popular presentations of scholarly reconstructions that become part of people's folkloric self-understanding. While it wouldn't be considered an 'invented tradition' in the above sense, an interesting analogy to some of these situations can be seen in Ivar Aasen's Nynorsk, an attempt to find the more purely Norwegian framework in the heavily Danish-overladen Norwegian language. He did this by working out what a purely Norse-based Modern Norwegian might be like. Thus we have the situation, which is remarkably common, of an actually traditional practice -- in this case, Dano-Norwegian -- in a struggle with a reforming purist-traditionalist practice -- in this case, Nynorsk -- both putting themselves forward as the appropriate tradition. In the case of the Norwegian language, this became tangled up with political disputes, leading to a considerable number of artificial interventions, none of which succeeded; and the result is that the Norwegian language today is quite an extraordinary mess, with no organic solution to the struggle yet found or, for that matter, in sight. In the end, only a long stretch of time and a lot of ordinary interaction will heal a muddle of tradition created by politics. * G. E. M. Anscombe, On Transubstantiation: "It is easiest to tell what transubstantiation is by saying this: little children should be taught about it as early as possible." * Hume as Historian at "Incudi Reddere"
* I'm thinking of doing some Unamuno for a fortnightly book this summer, so this discussion of his quijotismo by Mariana Alessandri is timely. In hope and faith is friendship formed. with step on step, we stride the way. and I to we thus weld as one. Social life is not a condition superadded to the individual life, but is contained in the very definition of personality which is essentially a rationally-knowing and a morally-active force--both knowing and acting being only possible in the life of a community. 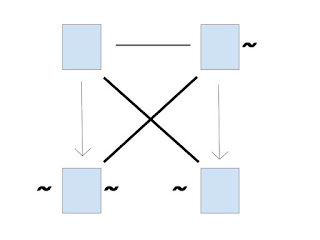 Rational knowledge on its formal side is conditioned by general notions which express a unity of meaning in an endless multiplicity of events; real and objective universality (the general meaning) of notions manifests itself in language as a means of communication, without which rational activity cannot develop, and, for lack of realization, gradually disappears altogether or becomes merely potential. [Vladimir Soloviev, The Justification of the Good, von Peters, ed. Catholic Resources (Chattanooga, TN: 2015), p. 221.] This clearly is influenced by the arguments of nineteenth-century traditionalists, but it looks like Soloviev has generalized some of the ideas slightly. from bough to bough flits the bird. the breath of God beneath its wing. Let us take some examples to see how we can use what we have learned so far. Suppose that I, being a wizard with a green thumb, am surveying my new garden of weird flowers. I have some things that I have in every quarter of my garden. That's a Box. I have other things that are in at least one quarter. And if something is in every quarter of my garden, it is in at least one quarter, and that means Box includes Diamond. So we want at least 1234D. 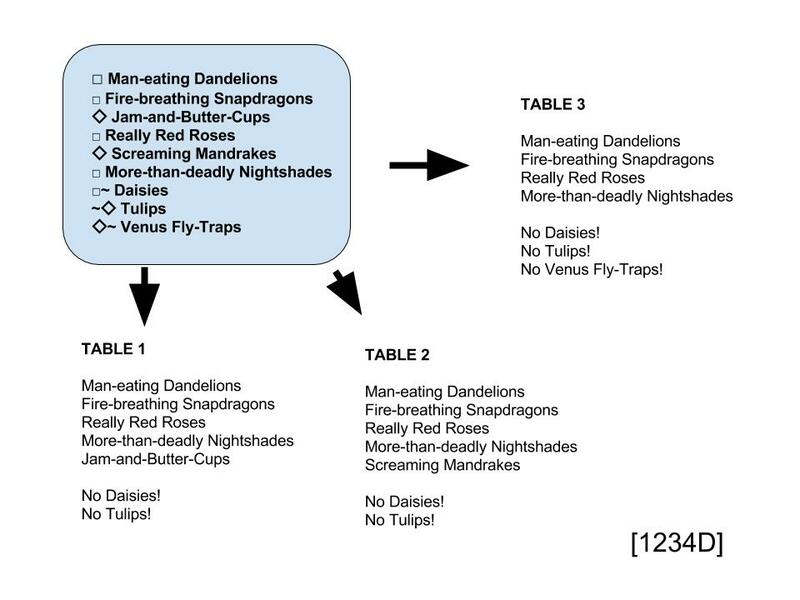 If we look at Diamond-Not (Venus Fly-Traps), this is the same corner as Not-Box (Venus Fly-Traps); it is inconsistent with both Not-Diamond-Not (Venus Fly-Traps) and Box (Venus Fly-Traps), since those both are the same. However, it doesn't tell us anything about the other two corners -- it's consistent with Not-Diamond (Venus Fly-Traps) and Diamond (Venus Fly-Traps). It's worth taking some time to explore how each of the corners of the 1234D square, both with Box and with Diamond, relate to the others, because it is just so very common, and if you know this very well, you know a huge amount of modal logic, because it's how you fully understand what a given Reference Table means. So let's think about what our other tables have to be, given our Reference Table. I put 'No Daisies' because we know that there are no daisies anywhere (Box-Not). And I put 'No Tulips' because Not-Diamond means the same as Box-Not. With the flowers that are only Diamond, though, we have to be much more careful, because while we know they each are on at least one table, we don't know which or how many! Maybe Jam-and-Butter-Cups are only in one quarter. Maybe they are in two. Maybe they are in three. It could even be that they are in all four. Our Reference Table doesn't tell us. And it's even trickier, because we have more than one Diamond, and we don't know if they are talking about the same quarters or different quarters. There are lots of possibilities. So when I put them on my table, I can't assume that every table is a different quarter. Maybe I am accidentally giving two incomplete descriptions of the same table, and they really should be on the same table! But I can't just put them on the same table, either, because maybe they are all on different tables! Since the Reference Table doesn't tell us, we have to be careful to remember that we don't know these things. Not assuming that you know something you don't is often the single most important thing in logic. (1) I have at least one quarter with Jam-and-Butter-Cups. (2) I have at least one quarter with Screaming Mandrakes. (3) I have at least one quarter without Venus Fly-Traps. Again, I don't know if these quarters are the same or different. If I put them all on one table, I might be wrong. If I put them on different tables, though, then as long as I remember that any of my tables might be incomplete, and that any two tables might be giving incomplete descriptions of the same quarter, I will be just fine. No Daisies! No Daisies! No Daisies! No Tulips! No Tulips! No Tulips! 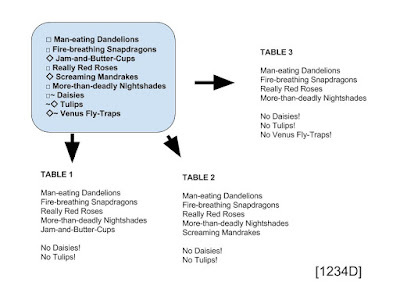 Jam-and-Butter-Cups Screaming Mandrakes No Venus Fly-Traps! and tumbles down with kitten charm. upon your lap, for you to keep. valiant to rise and sure to endure. seizing the moment to capture the prize. Eivør, "Í Tokuni". Faroese, apparently, which is a language one does not often hear sung. time is not enduring for man, O love;soon lost are our sweet dreams. guarantees hope's death and our love's undoing. Sweetest of maids, hear! soul to soul, with swift knots. After such an intensive read as The Complete Old English Poems, I feel the need for something a bit lighter, so I'll be doing some Agatha Christie. (1) And Then There Were None: This was the first work by Christie I ever read, and it's been a while since I last picked it up. Arguably it's her best work in which neither of Poirot nor Marple appear, and Christie herself regarded it as one of her favorites because of the difficulty of plotting it. The title and song-scheme of the book have always been problematic for it. The original title was based on a blackface song that had become hugely popular in Europe, and thus would have been known by any European readers from their childhoods. The title was utterly unacceptable in America, so the title was changed to And Then There Were None -- certainly a better title artistically as well as morally -- and the song changed to "Ten Little Indians". Starting in the 1960s, American publishers started experimenting with making the title of the book, Ten Little Indians, as well, but this never completely took. Interestingly, the British continued to use the original title all the way into the 80s. And Then There Were None seems to be the title that will stick. Racial issues are at least part of the background of the story, though -- the people in the book all have a rather nasty side to them, which includes considering themselves decent despite the fact that they have lived on the murder of others, for reasons of race, or class, or the like. (2) Murder on the Orient Express: The Orient Express, of course, is a European rail line, at the time connecting Istanbul to Paris; for most of the novel the train is stuck in Yugoslavia due to a blizzard. It is arguably Christie's most closely researched attempt at verisimilitude, as she attempted to get all the details right down to the right kinds of door handles in the cars. It is one of her Poirot works. And, of course, it is one of Christie's most famous mystery twists. (3) The Murder of Roger Ackroyd: Another Poirot novel, this is certainly one of her most influential works, although in it she breaks one of the long-standing conventions of mystery novels. Any preferences for which should be the priority, if I finish the three with enough time to add in a book or two more? stood by the shores of lakes are orators, and clear ones. now unravel the webs of orators and make them worthless with simpler utterance. they proclaim one God, not one of many. St. Romanos the Melodist, "On Pentecost", On the Life of Christ: Kontakia, Ephrem Lash, tr. Yale University Press (New Haven: 2014) p. 215.
with honor acting before God. and, God's own balm, will heal the soul.